Virtual reality is still a new and emerging technology. With a laundry list of restrictions, from the cost of purchasing a headset to the limits of software and computing power, we’re a long way from the world of Ready Player One. That hasn’t stopped ambitious developers from exploring this new genre. One such studio, Stirfire Studios, set out to create a peaceful, relaxing puzzle game which would fully embrace and utilize virtual reality, and thus the concept of Symphony of the Machine was born. Within this stunning game, gorgeous scenery, puzzle solving and gardening intertwine to create a delightful, satisfying and very zen experience. Upon spawning on a dry, barren planet, you ascend a tower which bears a striking resemblance to the Sheikah Towers in The Legend of Zelda: Breath of the Wild. Fortunately, you are not expected to take on the role of Link in this game, and so you get to press a button and lounge about as an elevator ascends the tower for you, freeing you to drink in the beautifully rendered desert landscape and the picture perfect sky and clouds. Upon reaching the top platform, you are greeted by a chipper, floating robot which reminded me, in both form and personality, of the head of BB-8, the much loved binary-babbling droid from Star Wars. Your new robot friend presents you with a mirror, a pot and a seed, and wordlessly provides you with the basic information you need to operate the ancient technology located within the tower known simply as the Machine. You are challenged with the rather significant task of terraforming the planet. Fortunately, you stand in front of the Machine, which is capable of manipulating the weather, allowing you to awaken the long dormant seeds buried deep within the dry, scorching soil of the planet. You’ll be tackling each type of plant one at a time, and your handy-dandy robot friend has all the information you need about what kind of conditions each plant needs to grow. Armed with this knowledge, it’s up to you to manipulate the Machine and bring this barren world back to life. The weather is manipulated by shining a beam of light onto one of the four glyph panels located around the Machine. Puzzles start out simple enough, requiring you to activate sun, wind, cloud or rain glyphs by using a mirror to divert the beam of light onto them. While activating a glyph changes the weather, it also triggers a shield, a set of honeycomb like panels which block light beams. 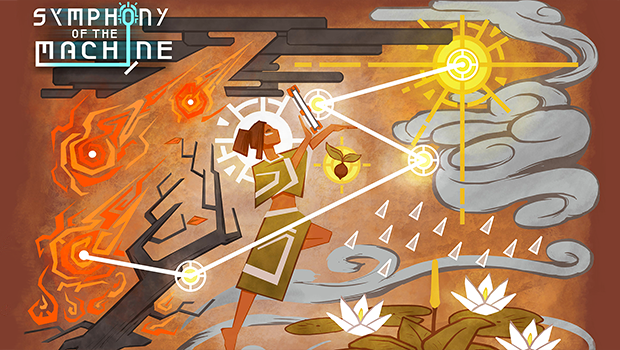 Puzzles become increasingly more difficult over time, requiring you to circumvent shields and activate several glyphs at the same time via the use of mirrors, T-shaped light splitters, and even elemental cells which manipulate the climate’s temperature. It’s amazing how intuitive the gameplay feels. I’ve played several wordless games, where information is communicated via pictographs rather than dialogue, and none have have communicated as effectively, nor as clearly as Symphony of the Machine. That is partially because of the simplicity of the game’s concept, but outside of my rather bad habit of confusing the wind and cloud glyphs, I was never once confused about what I needed to do in order to solve a puzzle. Interacting with objects feels very natural, you simply need to reach out and ‘grab’ it by squeezing the trigger on the Vive controller. Everything can be tilted, turned and twisted, and the game’s physics are spot on. Every panel, splitter and beam of light interacts exactly as you would expect them to. Dropped objects will hover in the air, something which defies the laws of physics, but makes bending light beams and keeping track of your various Machine manipulation tools very convenient. I did encounter a hiccup where the computer thought I had let go of an object when I still had the trigger pulled, but this is an incredibly minor glitch, it happened only two or three times during more than an hour of gameplay, and did not pull me out of the experience, it simply required that I grab the item again. This game is gorgeous in every sense of the word. The music and ambient noise are perfect, setting the mood without distracting you from the world, and the sounds of the wind, rain and thunder are convincingly real. The controllers vibrate just enough as you ride the elevator up and down, and while it’s a fun to watch the little potted plants grow as you give them their favorite weather conditions, the real treat is to look up and beyond. The world itself changes as you progress. Barren hills become lush and green, mountain tops sprout pine trees, the whole world changes from sterile to alive before your eyes. It’s easy to get lost in this reality, it feels comfortable, it’s beautiful, and hours have a way of slipping away, unnoticed, while playing. Watching the weather change is possibly my favorite part of this experience. By combining different glyphs, you can spawn tornadoes, thunderstorms, blizzards and even a double rainbow (all the way!). My friend spent a good five minutes sliding the ice glyph in and out of a beam of light pointed at the rain glyph, watching as, at his command, raindrops turned to snow and back again. When combined with the amazing sounds in the game, you can’t help but feel gusts of cool air blowing against your cheek, or want to walk to the edge of the platform so you can feel warm rain droplets patter against your outstretched palm. While you won’t be doing a great deal of traveling within this game, you do need to move about occasionally. Moving is generally accomplished by pressing the disk on the front of the vive controller, which causes an arced line to sprout from your controller: Move your controller to roughly where you want to go. Pull the trigger and you will warp to that location, a warp that is, thankfully, accomplished without motion sickness. The top of the tower is a small enough area that you can pretty much move around by physically walking, so long as you have a moderately sized play area. The greatest fault of Symphony of the Machine is its relatively short gameplay. Stirfire Studios created a stunningly complete, believable world, but you will be able to power through all of the challenges of the Machine within an hour or two, depending on your pace and your puzzle solving skills. Once you have terraformed the planet, you can ascend the tower once again and continue playing, growing more seedlings, some with alternate colors to their originals, but you end up repeating the same, rather small sampling of puzzles over and over again. Speaking only to the artistry of the world within this game, Symphony of the Machine is an incredible value. It left me yearning for more games and experiences like this, and I wanted nothing more than to grab my paraglider and leap off the side of the tower to see what lies beyond the mountains. (That’s a Breath of the Wild reference, for those of you who have been living under a gaming rock.) Speaking strictly from a gameplay point of view, Symphony of the Machine is rather content-light for the full retail price of $20. More content could very easily be added to this game, so those hoping for a little more gameplay for their buck may want to keep an eye out for updates which bring more puzzles to navigate and more seedlings to cultivate. Symphony of the Machine is, by far, the best game to introduce newcomers to virtual reality. It sounds right, it looks right, interaction feels right, and there is no motion sickness to contend with. The only other introductory VR experience which has come anywhere close, in my opinion, is Star Wars Trials on Tatooine (which I wrote about in the games section here), and that only receives mention because of the nerd power that comes with wielding a lightsaber for the first time. Simply put, Symphony of the Machine is a must-have for those seeking to spread the VR obsession. Symphony of the Machine is the epitome of what a virtual reality experience should be. It nails everything from visuals to sound, from challenges to object interaction, all without a hint of motion sickness. This peaceful puzzler will calm your mind, challenge your brain, nurture your green thumb and leave you wanting much, much more. It's rather light on content, offering one to two hours of gameplay, but scores perfect marks in literally every other regard. While the short gameplay may be disappointing for those looking to squeeze every minute of entertainment out of their dollar, Symphony of the Machine is a must have for those dedicated apostles who seek to spread the gospel of VR.